The Maestà, or Maestà of Duccio is an altarpiece composed of many individual paintings commissioned by the city of Siena in 1308 from the artist Duccio di Buoninsegna, from which several panels are now dispersed or lost. The front panels make up a large enthroned Madonna and Child with saints and angels, and a predella of the Childhood of Christ with prophets. Duccio, di Buoninsegna, d. 1319. The Incredulity of Thomas, from Art in the Christian Tradition, a project of the Vanderbilt Divinity Library, Nashville, TN. http://diglib.library.vanderbilt.edu/act-imagelink.pl?RC=54254 [retrieved April 23, 2019]. 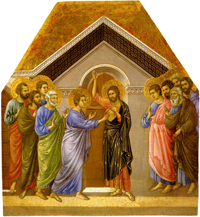 Original source: http://commons.wikimedia.org/wiki/File:The-Maesta-Altarpiece-The-Incredulity-of-Saint-Thomas-1461_Duccio.jpg.